In 2014 I ran not one, but two runDisney Half Marathons. These were the first half marathons I ever ran. 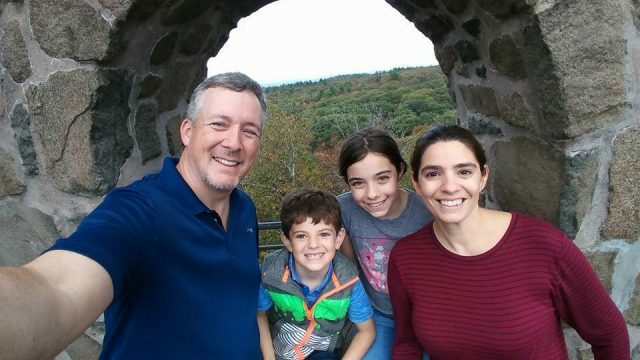 I learned a lot running my first during Marathon Weekend in January, and I thought that prepared me for what was to come when I ran the Wine & Dine Half Marathon in November. It turns out that no two runDisney races are exactly the same. 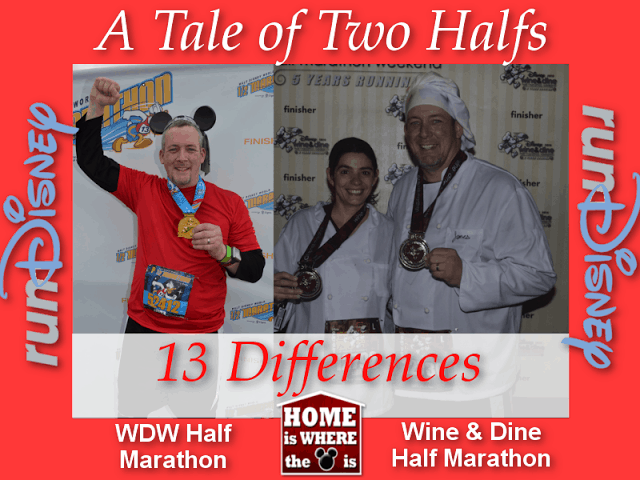 Here are 13 differences that I experienced between the WDW Half and the Wine & Dine Half. In the year leading up to my first Half Marathon I had two knee surgeries on the same knee. The result was that I hardly any real training time, I was fairly healthy and able to do quite a bit more running in the months leading up to the race. The extra training paid off because it made enduring the mileage and recovering from the race A LOT easier. I had to take a whole month off from running after my first experience. I was back to normal a lot more quickly the second time around. For the WDW Half, I was pretty much going it alone. I knew some other people running, but we were all doing our own thing during the race. 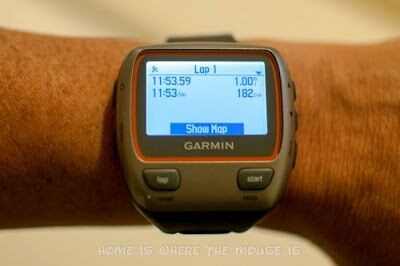 For the W&D Half, Lisa had decided to run with me, and we made a pact to stay together the whole race. She was a little worried I would leave her behind, but I would have never done that. Having someone to run with keeps you accountable during training and it also takes away some of the anxiety leading up to the race. It’s also nice to have someone to talk to during the race, and to be there at the finish line with you. In January, I was winging it. I didn’t have a plan. I almost got swept and didn’t even realize how close I came until afterwards. For November, Lisa wasn’t going to let us go in without a plan. Our goal was to finish. Lisa had only completed a 5k before this, so our concern was being swept. We said up front we wouldn’t be stopping for all the characters. We knew we were starting in the last corral, and we knew that as long as each mile we completed was under the 16-minute minimum pace, we’d be building a cushion between us and the dreaded balloon ladies. When I ran in January, I just dressed to run. I wore what I had been training in because I knew I’d be comfortable. For the Wine & Dine, we decided to get into character. It definitely made it more fun, at least leading up to the actual race. 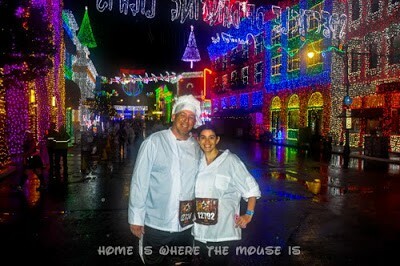 We decided to dress up as Linguini and Colette from Ratatouille. 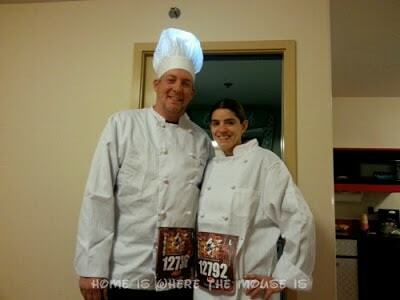 We had more than a few people ask us if we were really chefs. This is one of those things I was clueless about for some reason. During runDisney events, certain resorts are designated as “host resorts”, which means they’ll have transportation to/from the events. If you’re not staying at a host resort, you’re on your own. It was pure luck that we booked Old Key West that first race weekend and had the complimentary buses to get us where we needed to go. 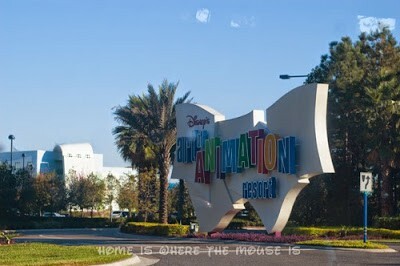 For the Wine & Dine, we booked at Art of Animation because we really wanted to stay there. Unfortunately, it wasn’t a host resort. We had to walk over to Pop Century to get the bus to the race. After we finished, you can imagine how thrilled we were to have to walk back over from Pop to AoA. ugh! The WDW Half and the W&D Half are different courses. In January, I started on Epcot Center Drive and ran to the Magic Kingdom, running through the actual park and Cinderella Castle. The course then took me through some backstage areas and out to World Drive and back to Epcot for a brief run through Future World and then out to the finish line. The W&D started over at the Wide World of Sports Complex. From there, we ran “to the animals” over at Disney’s Animal Kingdom, running through the park and then heading over to Disney’s Hollywood Studios, where the wardrobe department from the old Backlot Tour was turned into a disco tunnel and we ran right through the Streets of America with the Osborne Lights on! 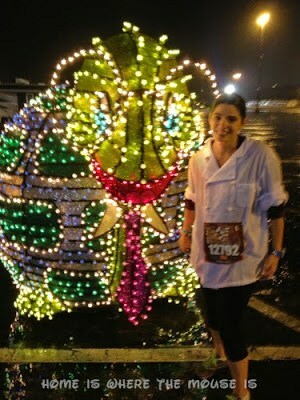 For the WDW Half, I had to wake up before 4am to get ready and get over to the starting line for a 6am race. That can be a task even if you are person who gets up bright and early. I am NOT a morning person, so that was especially rough. The Wine & Dine is a night race. That’s right up my alley. Most of my training runs are late at night just because that’s when I find it easiest to run. 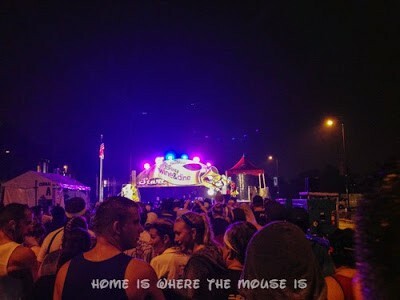 The dark of night made the fireworks a little better, and it was AMAZING to run through the Osborne Family Spectacle of Dancing Lights, but there were a number of places where the dark made it difficult to see obstacles or give you scenery to look at while running. Obviously, it’s typically cooler at night then it is during the day and you don’t have the sun beating down on you. On average, November is about 9 degrees warmer than January in Orlando. So you’d probably be right in guessing that a night race in November probably shouldn’t be far off from the temperature in the morning in January. Neither of these races took place in the summer, when you’re practically guaranteed an afternoon rainstorm. On average, both January and November see a little over 2 inches of rain per month. They are relatively dry. So while the only moisture I had to deal with in January was my own sweat and the water I may have poured over my own head, Mother Nature took it upon herself to turn the Wine & Dine into the “Splash & Dash”. It didn’t rain very hard, but it started as soon as we lined up in our corrals and it didn’t stop until after the race was over. That was over 4 hours of non-stop wetness. Because of that, a lot of the on-course entertainment was not present, though many volunteers and cast members were braving the elements to support us! It wasn’t long before we were soaked, and that made the cold feel even colder. And being the dummies that we are, we didn’t bag check a change of clothes. We were pretty miserable. 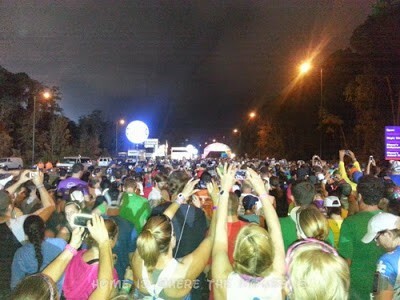 The WDW Half had nearly twice as many runners as the Wine & Dine Half. In January, the last corral was “P”. For the Wine & Dine, the last corral was only “L”. 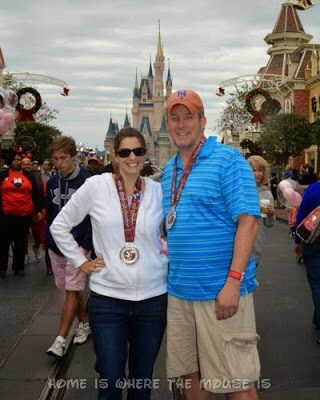 Despite that, the W&D course seemed a lot more crowded and difficult to navigate than the WDW Half, at least for us. This was probably due to a combination of all the factors we’ve mentioned. It was a night race so there were areas where you needed to watch your footing. That was especially true due to the wet conditions as well. But above all that, the W&D course has a lot more twists, turns, and places where the path narrows to a point where you can’t fit too many people at once. All of this caused a lot of “bunching up” in the rear of the pack. It was hard to even use a run/walk system because sometimes when it was time to run, you’d be blocked in by people who were on a walking interval. Even the balloon ladies couldn’t maintain their pace. We saw them running to make up time more than once. 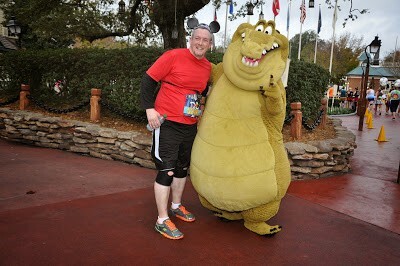 The WDW Half Marathon was a lot of fun. I had some nervousness leading up to the race and there were moments during when I questioned what I was doing, but overall it was a blast! The crowding, the cold, the rain, and the lack of characters and entertainment on the course during the Wine & Dine Half Marathon made it seem less like fun and more like a lot of hard work. I was worried for Lisa because I had partially counted on the excitement of it all helping to carry her a bit like it did for me in my first race. This was a much tougher run, and it got really crazy when the balloon ladies suddenly started to run, because that freaked out a lot of people who thought they weren’t in danger of being swept, which led to even more bunching and crowding at times… it was borderline Black Friday stampede conditions. One of the big selling points of the Wine & Dine Half Marathon is the after party that is included in your race registration. Once you cross that finish line, you can head into Epcot and enjoy food and drink from the Food & Wine Festival with entertainment, characters, fellow runners and their families. Marathon Weekend doesn’t have an after party for any of its races. They end earlier in the day and the parks are open to the public. You are free to go back to your resort to rest or head to the park on your own if you feel up to it. In January, I met Lisa and the kids inside Epcot where we hung out before heading back to the resort to relax in the pool, and then capped the night off with dinner at ‘Ohana and the parade and fireworks in Magic Kingdom. The Wine & Dine after party begins before the race finishes, so the longer you take to cross the finish line, the less time you get at the party. In our case, not only did we take a while to get to the party, we were so soaking wet and cold we couldn’t enjoy it. We did our best. We actually entered Epcot and made it halfway through Future World, where we ducked into Starbucks to warm up. That was it for us. We were done. We called it a night and headed back to the resort. We did manage to get some time at Magic Kingdom the next day before leaving for the airport. The last difference on this list is the medals. I love that they have different designs for each race and that they change from year to year. 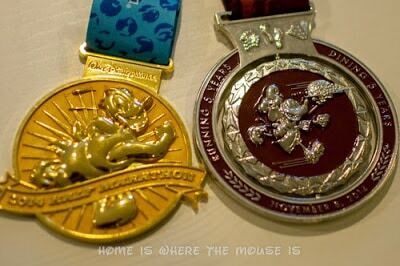 It’s a great incentive to run more runDisney races so you can add to your collection. I love the Donald medal I earned for finishing the WDW Half Marathon. It was my first medal, and as such it’s incredibly special. The Wine & Dine Half medal is really cool too. It is a little bigger and the middle spins. One side shows Spaceship Earth and the other side has Chef Mickey. I’ve heard reports of these breaking, so we’re being extra careful with ours. 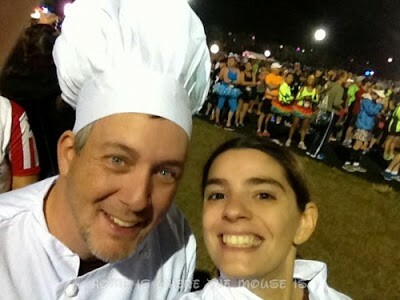 The Walt Disney World Half Marathon was the better overall experience for me. That said, much of what made our experience at the Wine & Dine somewhat less than magical were things that neither we, nor runDisney, could control. 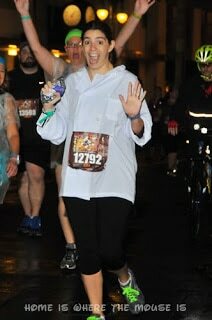 There were definitely some magical moments during the Wine & Dine, and crossing the finish line with Lisa was awesome! Would we do it again? I’d like to give the Wine & Dine another shot. Hopefully, I’ll get the full experience with the entertainment and after party the next time around. I’m not sure if Lisa would do it again. 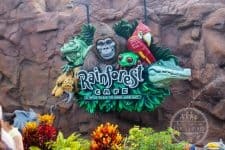 I definitely prefer the WDW Half course from Epcot to Magic Kingdom and back vs. the Wine & Dine course through Animal Kingdom and Disney’s Hollywood Studios. Of course, on my bucket list is the WDW Marathon, which would take me through all four parks! It just goes to show you that no two runDisney races are the same. We’re making plans for Princess Half weekend in WDW for February 2016. It remains to be seen what races we’ll each run, but we’re confident we’ll be there, and we’ll be running! UPDATE: Lisa and I are signed up for Princess Half Weekend 2016!! I will be doing the Glass Slipper Challenge (10K and Half Marathon). Lisa has signed up for the 5K AND ANOTHER HALF MARATHON!!!! Our daughter Bella will be doing her first 5K and Jackson is going to step up his game and do the Mickey Mile this time around. In non-runDisney news, I’m just a couple of months away from running my first marathon here in New York City, and I’ve got my eye on a couple of half marathons to complete as part of the training. If that all goes well, I may start looking ahead to a possible Goofy or Dopey in 2017?? 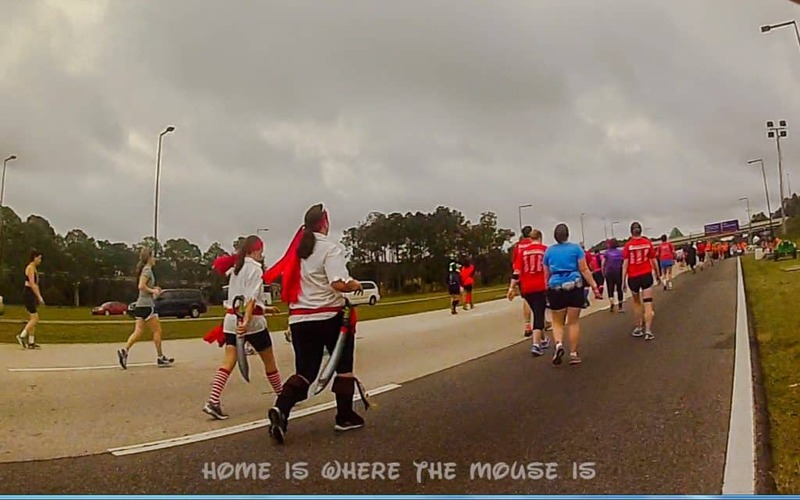 Have you run more than one runDisney race? What were the differences for you? Don’t be shy. Leave a comment or send us a tweet @advinfamilyhood! GREAT updates. I followed your other blog post to this one. The WDW Princess 10K will be my first runDisney event and I am really looking forward to it. Although I haven't run a 10K since 1984 I've walked several and a few weeks ago started the Galloway Run/Walk/Run method to train. Am I insane to already be thinking about the Tinkerbell half-marathon next year at Disneyland? How did your wife feel running the half? Congrats to you both. Thank you! Lisa felt that the half was very tough, due to the weather, it being at night, and not being properly trained for it. I honestly thought she would never try for another Half and just stick to the shorter races. Well, we are both signed up for the Princess Half in February. I'm doing the Glass Slipper challenge, while Lisa will be doing the 5k and the Half. Our daughter will be 9 and she's doing her first 5k too. I don't think you're crazy to already be looking beyond the Princess. As long as everything is going well with your training, I think it's a good idea to occasionally think about what happens next. Good Luck! Maybe I'll see you in February! !